Bring a traditional Louis Philip styling to your master suite with this sleigh bed. Crafted with a dark black or crisp white finish, it easily matches with existing decor. Both the headboard and footboard curve outward in classic sleigh bed styling, lending the piece a sense of shape and movement. Decorative paneling brings additional accent to refine. 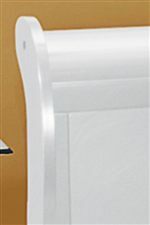 Lifted on rectangular legs, it is structurally strong with the added benefit of a refined design. The Louis Phillipe California King Sleigh Bed by Crown Mark at Casa Leaders Inc. in the Wilmington, Long Beach, Torrance, Lakewood, Los Angeles area. Product availability may vary. Contact us for the most current availability on this product. 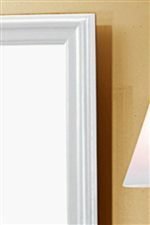 B3650-CK-RAIL King Rail For B3600 White 1 81.5" 5.83" 2.75"
Decorate your master bedroom with the refinement of this collection. Traditionally styled with a formal look and feel, it features a number of bedroom storage pieces as well as a beautiful sleigh bed to outfit your bedroom space. Offering both style and storage, each piece is finished in a rich black or crisp white and select pieces have drawers for storage. A classic collection that will be admired by many, any piece from this collection is an elegant addition to your home. The Louis Phillipe collection is a great option if you are looking for Traditional furniture in the Wilmington, Long Beach, Torrance, Lakewood, Los Angeles area.